The mostly used steering system is rack and pinion and mostly 80 percent commercial vehicles are using this type.And this is the simplest one, fewer parts and easy to design. The rack is housed in Tubular casing. The casing is supported on the frame near its ends. The ends of rack are connected to the track rod with the help of ball and socket joint. The pinion shaft is carried in the plain bearings housed in casing. The pinion is meshed with rack and clearance is adjusted with adjusting screw. It’s objective to convert the rotational motion of the steering wheel to linear motion of the rack. 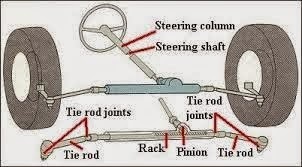 While the driver turns the steering wheels the steering column rotates with the steering wheel, and other end of steering column is connected to pinion gear by means of universal joint and it rotates the pinion gear on the rack which consists of teeth in it. The linear motion in rack is converted in to tie rod, which is connected to the rack rod on both end which is connected to the wheels by the means of stub axle. Steering ratio is the main criteria while designing the steering system. It is nothing but the ratio of the number of teeth in the rack rod to the number of teeth in pinion gear. wheels 4 or 5 full turns to turn the vehicle from full left to full right, so here the driver have to give more effect to turn the steering wheel but the steering wheel is easy to turn only number of turns are more. it is due to low number of teeth in rack rod and smaller radius pinion gear. when we use the pinion gear with higher or greater radius and more no of rack teeth, the driver have no need to turn more rotation of steering wheel, but it is hard to turn at this case. 1.It is small and compact unit. 1. No mechanical advantage is obtained. 2. Some steering effort is lost in friction.